So it seems to sixteen-year-old John Pulkis, who can’t get up the nerve to ask classmate Sue Nielsen for a date. But he’s come up with a plan: he’s bought two tickets to the Doobie Brothers at Vancouver’s Pacific Coliseum—these will give him the courage that he lacks. Only now there’s a new problem: he’s lost the tickets! Sue is about to embark on a field trip to Alaska, so he needs those tickets soon—by tonight. To find them, John, a budding scientist, turns to the only sure-fire way he knows: the scientific method (complete with graph paper). You can’t miss with that. 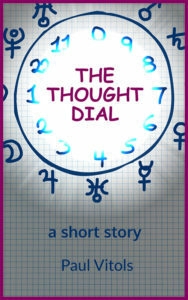 Loosely based on some of my own experiences growing up in North Vancouver, The Thought Dial first came into existence at the end of 1992, shortly after filming had finished on season 1 of my TV series The Odyssey. I was glad then that I had kept a journal back in 1975: many details of the story are lifted from it. I have dedicated the story to the memory of John Bennett, who taught social studies at Balmoral Junior Secondary School while I attended there from 1972 to 1975. Mr. Bennett is the basis of my character Mr. Watson, who plays a pivotal role in the story. Indeed, Mr. Watson gives a talk that Mr. Bennett gave to us students in 1975. When I first drafted the story in 1992, I thought back appreciatively to my time in his class. While finishing the story all these years later in 2017, I discovered that Mr. Bennett had recently died, aged seventy-six. This coincidence gave me the idea of offering The Thought Dial to his memory, for I think he would have enjoyed it. Certainly, in my depiction of Mr. Watson I have tried my best to do justice to John Bennett as I knew him.